The last time I featured Aldi products it was to showcase some of their top of the range frozen foods, this time I've been asked to take part in the Aldi Challenge. 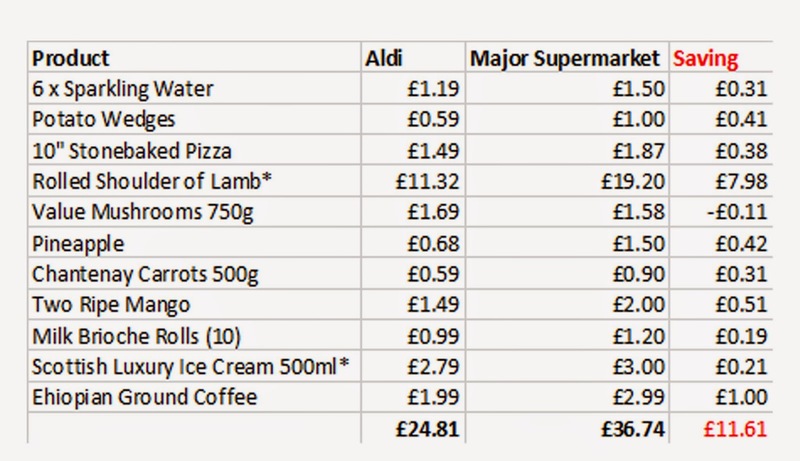 The Aldi Challenge is an initiative to ensure that every shopper can enjoy January, if you shop at Aldi you will still have money to spare for enjoying new activities and eating well. Here is my shopping comparison, I couldn't believe how much I saved. 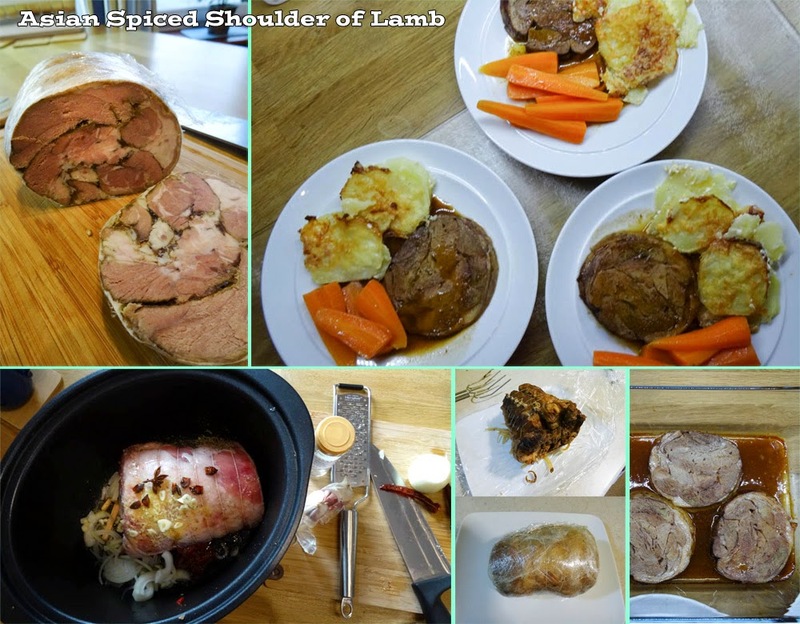 The Rolled Shoulder of Lamb at Aldi was Scotch Lamb with the QMS mark on it and the comparative lamb at the major supermarket was 'British' Lamb with the Red Tractor. Generally Scotch Lamb is more expensive than British Lamb. The ice cream I bought at Aldi was a named brand and the comparative tub of ice cream was top of the range own brand. 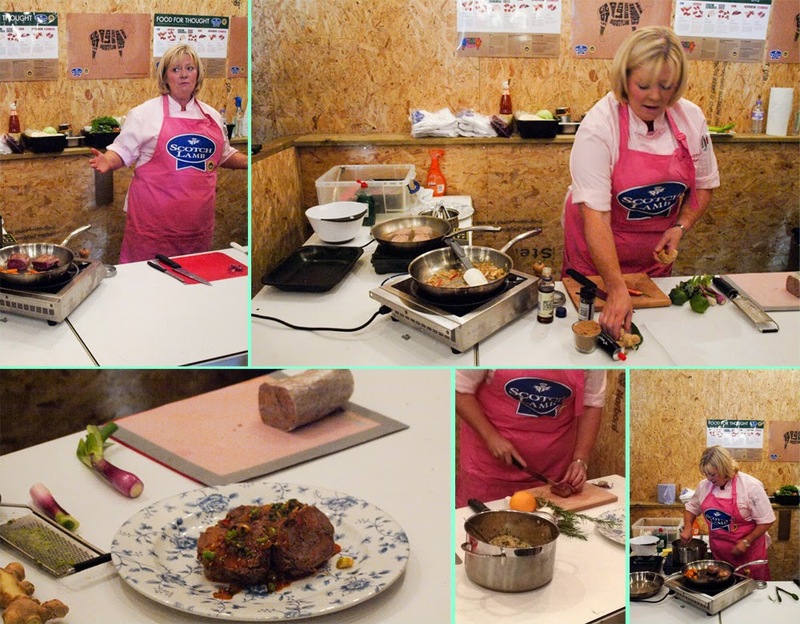 I first saw this recipe demonstrated by Jacqueline O'Donnell, of The Sisters Restaurant, for Quality Meat Scotland. She kindly gave me a copy of the recipe and says "this dish is worth all the effort in time for maximum taste" I would certainly agree with that. 3. Put in the oven at 140C for 4-6 hours or 8-10 hours in the slow cooker/crockpot. 4. Once it is fork tender, remove the lamb from the dish and lay onto several layers of cling film, roll up tightly. For best results refrigerate the lamb overnight, wrapped in cling film. 5. Allow to rest whilst you reduce the stock in the pot by at least 2/3 adjusting the flavour to your liking I also chilled the stock overnight before reducing, this meant I could remove a thick layer of fat. 7. To serve slice lamb very thickly, through the cling film, then remove the film and any string holding the rolled lamb together. As I had chilled the lamb, I then placed the slices in an ovenproof dish, spooned over a little of the reduced stock, cover with foil and reheat in the oven for 20 minutes at 160C. 8. To serve, carefully lift the lamb slices onto the plate and and spoon the reduced sauce over the top serve with either rice or potatoes. I served the Asian Spiced Lamb with Chantenay carrots and potatoes sliced, dotted with garlic butter and covered with single cream. The lamb fell apart and tasted fantastic, the flavours of all the spices had amalgamated and it was the flavour of the lamb that dominated. I have also used this technique of cling film wrapping with brisket cooked in the slow cooker and it works equally as well, it's a really dinner party winner too as you can prepare the meat the day before. 1. Cut pieces of the brioche to fit base of 4 large or 6 small ramekins. Mix all ingredients except mango until fully combined and pour evenly into the ramekins. 2. Cut the mango and add a few pieces to each pot. Cover the pots with foil and bake in a Bain Marie (roasting tin filled with enough boiling water to come half way up the side of the ramekins) at 160C for 30 minutes until firm. 3.Remove from the hot water, remove the foil and cool, then chill in the fridge for at least two hours. top with the remaining mango and serve. This recipe is all my own, I used the mango and brioche rolls from Aldi and some other ingredients I had in the fridge and larder. 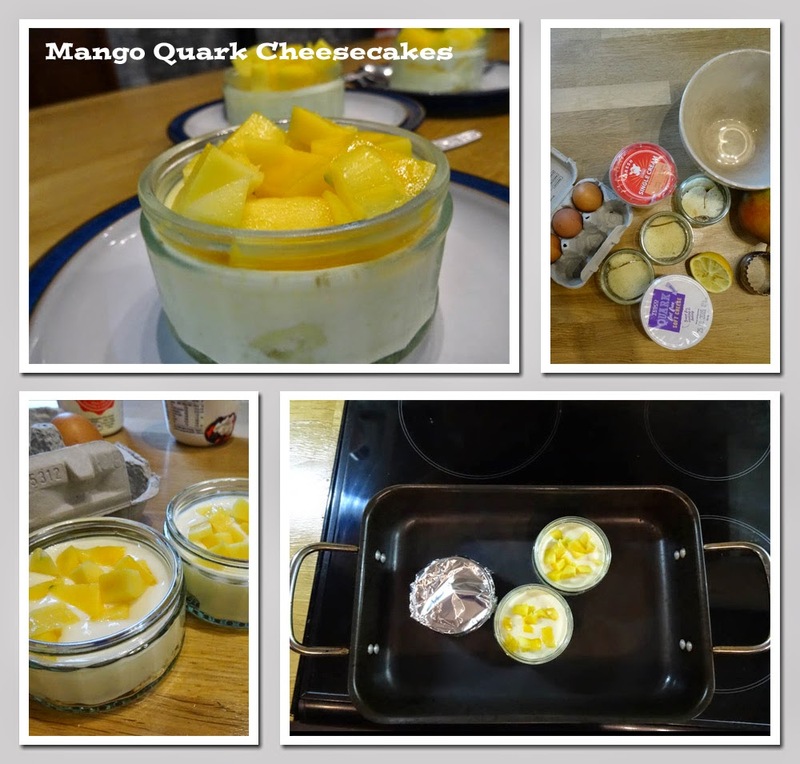 This is a light cheesecake which is not too sweet with most of the sweetness coming from the ripe mango. the lamb looks seriously good!... I do think Aldi get stuff so right. I must go shopping! 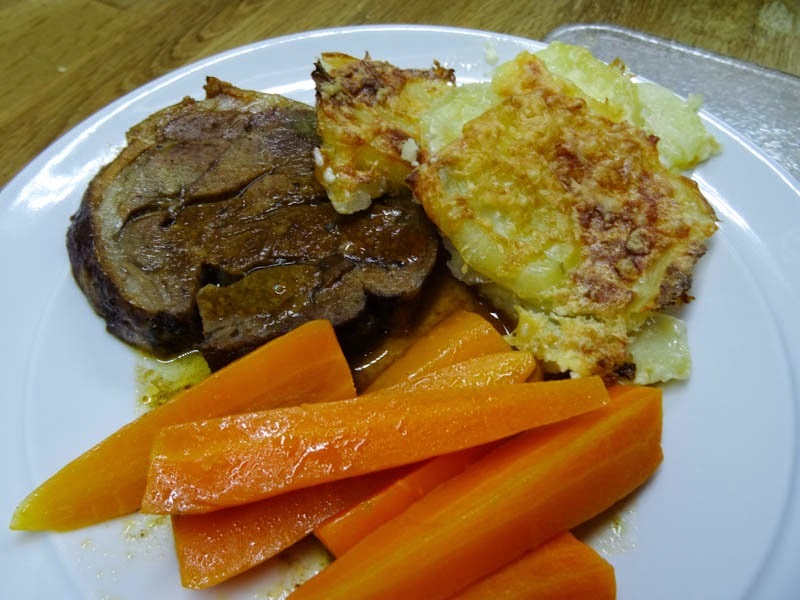 Shoulder of Lamb is such a great cut of meat, the spices and flavours here sound delicious! And that cheesecake sounds so fresh and tasty! Yum!